You're receiving this newsletter because you signed up at zengolf.com or are a friend of Dr. Joe. Hi Larry. This is one of the most common questions I’m asked. In fact, the title of my first DVD is Taking Your Range Game to the Course. It is also in a chapter of ZEN GOLF entitled “How to Get from the Practice Tee to the First Tee.” The key is to get into your course rhythm by playing some imaginary holes before leaving the practice range. This allows the transition between warm-up and play to be as smooth as you want your swing to be. 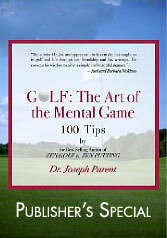 Listen to the audio chapter from ZEN GOLF: Mastering the Mental Game. There are different modes of learning–visual, auditory and kinesthetic (feel). Most instruction is so focused on the visual and feel aspects that auditory learning takes a back seat. However, many people find that the audio version of ZEN GOLF is a more powerful learning tool than the written form. Did you know that Dr. Joe personally recorded all three of his books? They are available in CD and/or downloadable formats. It adds a whole new dimension to hear Dr. Joe tell the stories and give the lessons in his own voice! You can listen for inspiration on the way to the course, or to relax on the drive home from work. And it’s obviously ideal for those who prefer listening to reading. 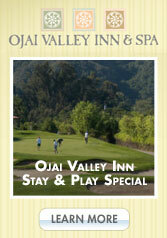 "Thank you for the wisdom that you provide in your Zen Golf book. I bought your book for my partner, a professional golfer, a couple of years ago. I was so pleasantly surprised to find a book that combined two of my favorite things–golf and mindfulness! Just recently I bought him the audio book version because he couldn't seem to find the time to read. Last week he began listening to your book, and he comes home excited to talk about what he heard from it that day. It was so wonderful to hear the improvement in his mental approach and attitude--incomparable to previous years. He is more positive, more present, and more gentle with himself. I am forever grateful for your wisdom, as it is exactly what he needed. It makes me very happy to see his excitement and enjoyment of the game once again!" 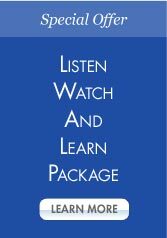 Get CDs or downloads at the Zen Golf Shop, or streaming audio in the Listen, Watch, and Learn Package. Dr. Joe coaches many junior competitive golfers who play on high school or college teams, as well as various golf association tournaments. The next generation of golfers and their parents understand the importance and edge that mental game coaching provides. Dr. Joe did half-hour sessions with each member of the Pepperdine University women's golf team on a recent Friday afternoon. They went out the next week and beat top-ranked UCLA and 13 other teams for their first tournament win of 2012. Dr. Joe’s other college players are seeing similar success. One high school golfer had a 45-minute phone lesson after shooting 88 in tournament; he shot 74 in his next competitive round. Drew Thomas, another high school golfer who has worked with Dr. Joe for two years, was named Player of the Year for her county, and has been invited to play in a qualifier for the Kraft Nabisco Championship. But the results are not limited to golf. Dr. Joe coached a relief pitcher on a highly ranked college baseball team; his confidence soared and his ERA dropped to 0.56, with18 strikeouts in 16 innings. Call 1-805-640-1046 or email us to schedule lessons in-person or by phone or Skype for the junior golfer or athlete in your life. Dr. Joe has an intimate understanding of what it takes to get to the top and how to stay there. He has the singular distinction of having helped players achieve the No. 1 ranking in the world in both the men's and women's games: Vijay Singh and Cristie Kerr. In the past 20 months, after Tiger Woods and Lorena Ochoa were overtaken on their respective lists, the top spot has often been a back-and-forth affair. It changed hands no less than a dozen times, with four players on each tour having a turn. Three of the players, Ai Miyazato, Lee Westwood and Luke Donald, had never won major championships. Yani Tseng's dominance has seen her leading margin in the points standing take a Tiger-like dimension, winning 9 of the last 17 tournaments she's played in, including two of three majors. Don't keep Dr. Joe a secret! Feel free to forward the e-newsletter to your friends. Yes, I would like to subscribe to Dr. Joes's monthly e-newsletter. Not interested anymore? Unsubscribe here.